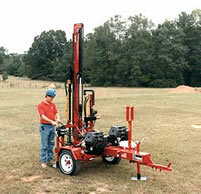 The smallest, all-hydraulic tophead rig on the market. 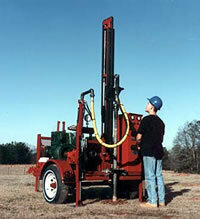 Designed for 2" and 4" wells to 200' depth in easier soils and unconsolidated formations. Rated for air or mud rotary drilling. Available with gas or diesel power and in truck, single- or double-axle trailer, track or skid mount configurations. The DR40 incorporates many of the features of the DR 100 and is designed in response to customers' desire for an even more compact drill rig. 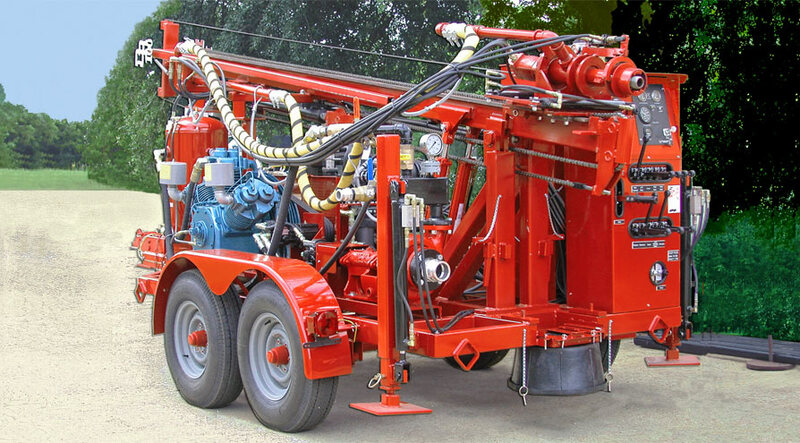 Employing two engines, one for the hydraulic rig functions and one for the mud pump, the rig can be gas or diesel powered. It can be fitted as a skid, single axle trailer, or mounted in the bed of a small truck. DeepRock manufactures a complete line of commercial drilling rigs with a flexibility of features unmatched in the industry. There has always been a demand for powerful, trailer-mounted, commercial drilling rigs and DeepRock manufactures a complete line-up of models with a perfect balance of power and portability. With its standard ball hitch, the DR20, DR30 and DR40 can be towed by car or pickup truck to nearly any drilling site and meet the challenges of the most demanding job. The DR 30 and DR40 can run a down-the-hole hammer using an auxiliary air compressor. 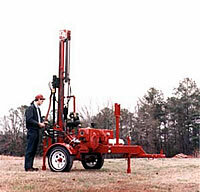 The DR 40 can even be directly mounted in the bed of a small truck for increased mobility. That is the kind of design flexibility only available with DeepRock rigs. Engineering and technical support is provided by DeepRock's engineering staff for all of its commercial rigs. needs may be, call or email Mike Beasley today for a free, no-obligation consultation.